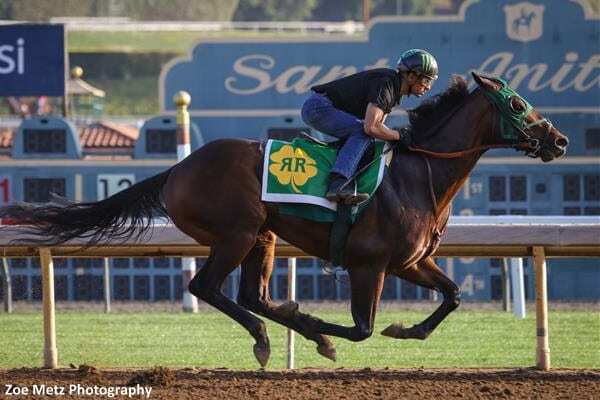 Bolt d'Oro, who won his first three starts as a 2-year-old in 2017 but has lost four of his last five, will be trained by Steve Asmussen when he returns to the track from a brief freshening. Mick Ruis, who owns and trained the two-time Grade 1-winning son of Medaglia d'Oro, confirmed the switch with Del Mar's publicity office on Thursday. Bolt d'Oro has been getting some R&R at Ruis' farm in Kentucky. Union Strike, a 4-year-old filly by Union Rags who won the G1 Del Mar Debutante in 2016, will also be transferred to Asmussen. She's lost six of her last seven starts since the Debutante, when she was trained by Ruis' daughter, Shelbe. Craig Dollase trained the filly for her next two starts, then Mick Ruis took over. Winner of his debut at Del Mar in 2017, Bolt d'Oro followed that victory with impressive wins in the G1 Del Mar Futurity and G1 FrontRunner Stakes at Santa Anita, then finished third as the 7-10 favorite in the G1 Breeders' Cup Juvenile won by Good Magic. Bolt d'Oro won his 2018 debut in the G2 San Felipe via the disqualification of first-place finisher McKinzie for interference in the stretch, then finished second to eventual Triple Crown winner Justify in the G1 Santa Anita Derby. He ran 12thin the slop in the G1 Kentucky Derby, then took on older runners in the G1 Metropolitan Handicap at Belmont Park June 9, winding up 11th after showing early speed. Bolt d'Oro will stand at Spendthrift Farm in Lexington, Ky., at the conclusion of his racing career. This entry was posted in Bloodstock, NL List and tagged bolt d'oro, medaglia d'oro, mick ruis, shelbe ruis, steve asmussen, Union Rags, Union Strike by Paulick Report Staff. Bookmark the permalink.